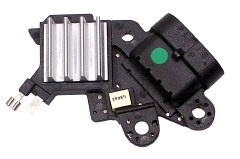 Notes: For version with Ford style terminals for OE Ford Regulator plug use V1200F. For version with under voltage warning light us V1300. For 24 volt version use V2400. 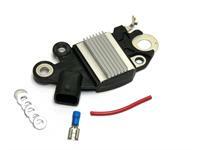 Part # 35162 - Voltage Regulator 12 Volt, B-Circuit, P-L-F-S Terminals, 14.8 Volt set point, 2.5 sec. LRC. For GM AD230, AD237, AD244 Series Alts. Voltage Set Point: 14.7 V Regulation: B-Circuit, Soft Start, LCR 2.5 seconds. For DELPHI AD230,AD237, AD244 Terminal Identification: P-L-F-S FOR USE ON: Chevrolet Silverado, GMC Sierra etc. 2 pin Voltage Regulator adapter kit. Converts current 4 pin regulator on GM AD244 or AD230 alternator to late style 2 pin regulator, fits General Motors AD230, and AD244 alternators.